Our Summer Detox Facial is back for $99! 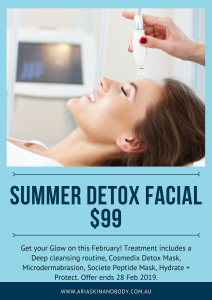 It’s time to Detox your skin with this month’s $99 Detox Facial! Detoxify your skin with this charcoal and clay based mask to gently exfoliate, draw out impurities and effectively cleanse away pollutants for a brighter, smoother more radiant complexion. Follow this with a light microdermabrasion to gently remove redundant skin cells and promote circulation before following with the Societe Peptide mask which uses a unique formulation of peptides, plant based stem cells and anti-aging ingredients for skin rejuvenation. Available February only @ Aria Skin + Body.